The Empirical CODE Orbit Model (ECOM) of the Center for Orbit Determination in Europe (CODE), which was developed in the early 1990s, is widely used in the International GNSS Service (IGS) community. For a rather long time, spurious spectral lines are known to exist in geophysical parameters, in particular in the Earth Rotation Parameters (ERPs) and in the estimated geocenter coordinates, which could recently be attributed to the ECOM. These effects grew creepingly with the increasing influence of the GLONASS system in recent years in the CODE analysis, which is based on a rigorous combination of GPS and GLONASS since May 2003. In a first step we show that the problems associated with the ECOM are to the largest extent caused by the GLONASS, which was reaching full deployment by the end of 2011. GPS-only, GLONASS-only, and combined GPS/GLONASS solutions using the observations in the years 2009–2011 of a global network of 92 combined GPS/GLONASS receivers were analyzed for this purpose. In a second step we review direct solar radiation pressure (SRP) models for GNSS satellites. We demonstrate that only even-order short-period harmonic perturbations acting along the direction Sun-satellite occur for GPS and GLONASS satellites, and only odd-order perturbations acting along the direction perpendicular to both, the vector Sun-satellite and the spacecraft’s solar panel axis. Based on this insight we assess in the third step the performance of four candidate orbit models for the future ECOM. The geocenter coordinates, the ERP differences w. r. t. the IERS 08 C04 series of ERPs, the misclosures for the midnight epochs of the daily orbital arcs, and scale parameters of Helmert transformations for station coordinates serve as quality criteria. The old and updated ECOM are validated in addition with satellite laser ranging (SLR) observations and by comparing the orbits to those of the IGS and other analysis centers. 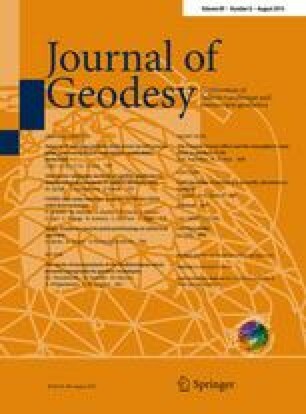 Based on all tests, we present a new extended ECOM which substantially reduces the spurious signals in the geocenter coordinate \(z\) (by about a factor of 2–6), reduces the orbit misclosures at the day boundaries by about 10 %, slightly improves the consistency of the estimated ERPs with those of the IERS 08 C04 Earth rotation series, and substantially reduces the systematics in the SLR validation of the GNSS orbits.